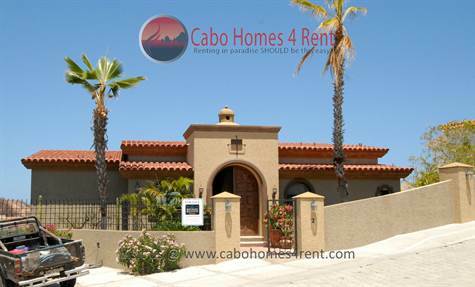 Los Cabos, B.C.S., Mexico long term rental homes, villas & condos. Available rental properties in Cabo San Lucas, Los Cabos Tourist Corridor and San Jose del Cabo. Specializing in relocation from the US & Canada, we can assist you with ALL facets of your move! Let us help you find your new home in Los Cabos and come live the dream! • 3 bath, 4 bdrm 2 story - $4,800.00 USD Monthly - Well priced luxury villa! Rancho Cerro Colorado, Cerro Colorado - Seeking a peaceful, luxurious home on the San Jose Corridor? Look no further than Rancho Cerro Colorado. Situated on the ocean side of the San Jose Corridor a mere 4 mins from the heart of San Jose del Cabo, the manned gates of RCC open to offer its residents tranquility, peace and understated luxury. With private access to the pristine Punta Bella beach, and the exclusive neighbouring communities of Palmilla Sur, Punta Bella & Palmilla, you can truly enjoy "la vida buena" (the good life) here in paradise. This beautifully renovated ocean view villa is fully furnished & move-in ready. Formerly a 4 bedroom home, this villa has been reconfigured to offer you 3 spacious ocean view bedrooms and a comfortably furnished media room located just off the expansive entertaining areas. The modern kitchen comes fully appointed and offers plenty of cabinet space as well as a sleek granite dining bar. Built to entertain, this villa offers both covered and uncovered outdoor living areas including a large ocean view pool, outdoor dining area, full outdoor kitchen w/ guest palapa and beautifully landscaped desert gardens. Other notable features include: floor-to-ceiling windows in the great room, dramatic entrance way & foyer, access to fiber optic internet (extra fee), and a 2 car detached garage! Find yourself: 2 mins to the beach, 4 mins to the Mega shopping & grocery plaza, 6 mins to historic downtown San Jose del Cabo, 12 mins to SJD International Airport and 16 mins to Cabo San Lucas. There are also 5 world class golf courses within 15 mins drive of your new home in Los Cabos! Available immediately on a 12 month lease. 1 month damage deposit due upon signing, 1st & last months rent due upon occupancy. HOA dues & annual taxes included in rental rate. Tenant responsible for all other utilities including (but not limited to): Pool service, gardener, electricity, phone/internet, propane, & satellite TV. Sorry, no pets allowed. You'll find that our approach towards business is an intimate one. After all, the best deals are built around solid relationships and friendships. We're not here to just sell you a house or help you find a rental... our goal is to make you a lifelong client & friend! Let us help you find what you are looking for in Los Cabos. It all starts with a call... your dream will unfold from there.